Asics uses lasers to measure feet in 3D. The Tokyo Marathon wound its usual way through the streets of Japan's high-rise-framed capital last weekend with thousands of runners proudly branded with the mark of sponsor Asics . One thing men's race winner Daniel Njenga probably didn't know, however, is that Asics recently kicked off a high-tech 3D shoe-fitting system in its Japanese shops. 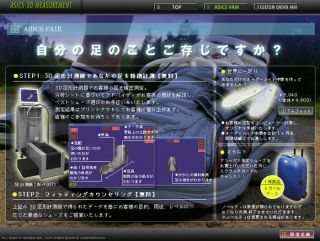 The 3D foot scanner is in place in the shoe specialist's shops across Japan, as well as in a few affiliate stores selling Asics trainers. With a view to matching runners' feet with the most suitable shoes, the system uses four laser beams and eight digital cameras to map each foot precisely. The equipment takes 20 seconds per foot and measures seven key points, including length, breadth, instep height, heel inclination and ball girth - all crucial factors in the finely balanced biomechanics of running. The result is a readout that allows specialist staff to select running shoes that offer the best combination of support and efficiency, which is essential to avoid injury. If it all seems like a quantum leap from those childhood sliding-scale feet measurers in shops, that's because it is.